These DIY black and white wedding kits are just deliciously pretty. The filigree birdcage and two love birds have a touch of French frou frou! Use pure Black and White or add a bright color, or print on colored paper. These printable designs are very ink-saving and the range has lots of items for a budget-friendly pick-n- mix. There is also a separate basic set that is concise, yet complete. Black and White invitations, favors, elements and pattern pages are easy to use and are professionally designed by Anni Arts for you the budget-conscious bride! The Birdcage Basic set is a concise, yet complete wedding set and has Black and White invitations, table items and extra bridal stationery. It is versatile and coordinates beautifully with items in the combo. Note: it is also included in the combo. many different choices for cards, favors and table items, plus elements for scrapbooking or artisan cards. There are aperture photo cards and square cards as extra cards for more Black and White Invitations, Thank You, Save the Date stationery choices. There are also craft elements and ten favor boxes, wraps and packets. Pattern pages are great to print on card or paper for crafts using templates, as wrapping paper or scrapbook backgrounds. The perfect way to add extra items of your choice to your wedding printables. The Anni Arts Pattern Pages are very versatile pages with repeat patterns from the various ranges. Pattern Pages with graphic patterns like dots, stripes and ginghams in coordinating colors too. Tip: All Pattern Pages are also super to print or iron onto fabric for small sewing projects and favors! Do you like the Birdcage series? Should I add items? Scroll down to comment ! Choose either JPG or PNG format. The PNG frame centers are transparent to easily add photo's for personalized Black and White invitations or scrapbook pages. The pattern sheets on the photo are available (see below) in many colorways to make papercrafts to decorate with the Birdcage Elements. Use these special Birdcage Elements to add extra items to the sets. There are coordinating frames, borders, tags and pretty little pics for photo cards, photo tags and wedding template crafts. A perfect mini scrapbooking set. This square card, envelope plus BONUS card insert, is another choice for your black and white invitations, wedding correspondence or Save-the-Date cards. 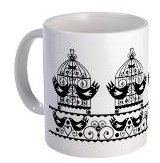 There are two pages with two different designs: a birdcage repeat and a lovebirds repeat. See thumbnail for two Pattern Pages plus the close-up detail of each next to the design. A cornucopia cone to place on a serving plate, place in a container such as an empty glass, or hang up by adding ribbon or paper handles. Fill with sweets, chocs or almonds. be fully wrapped or have crimped style edges which can be cut with a decorative edge.It makes a quick and perfect gift. Embellish it further with items from the kit, or trim and use as card topper for a big card. This pillow pack is super easy to make and ink-saving to print. Fill with sweets, chocolates, almonds or another type of favor. The choc wrapper can be cut to one of two sizes: for a hershey type 1.55 oz chocolate bar or a 100g European slab like Green and Black's Organic slabs. Wrap if you print on paper or tie ends through punched holes if you print on cardstock like on the photo. The heart basket needs handles of ribbon or cardstock through the back, on the sides or from front to back. Extra sticker and print handle included. The tea bag envelope can also be used for certain coffee pod sizes, or can be a pretty gift envelope for something else like a charm, ornament or jewelry. Or stack in a nice bundle tied with ribbon. There are TWO on the page. A versatile little bag to fill with candy,coffee or cocoa, or use as a pretty gift container for something else like an ornament or jewellery. Great for potpourri too. Fill coffee, cocoa and any loose-leaf herbs and tea in food-safe plastic bags first. A little packet to fill with candy, seeds, bath salts or cocoa. Or use as a pretty gift envelope for charms, an ornament or jewelry. Great for potpourri too. Fill coffee, cocoa and loose-leaf herbs and tea in food-safe plastic bags first. The square gift box can be filled with a small cupcake, muffin or a fluffy meringue. Line the base with food-safe paper like wax paper first to avoid fat stains. Or simply fill with candy or chocolates. Can't craft, won't craft? There are pretty ready-to -order items too!